"What are you doing?" "I gotta go steal back some drugs for these gang guy so I can get my dog back." RLJ Entertainment has released an official trailer for a new action comedy titled Once Upon a Time in Venice, starring Bruce Willis and John Goodman. This film seems like a straight up John Wick rip off, but maybe it's not even that, perhaps it's a John Wick spoof, a "SoCal John Wick". There's a badass guy in disguise, and someone steals his dog, so to get him back he has to bust some heads. Simple as that. The cast includes plenty of cool people: Jason Momoa, Famke Janssen, Elisabeth Röhm, Kal Penn, Adam Goldberg, Thomas Middleditch, Stephanie Sigman, and Wood Harris. This kind of looks fun, but it also seems like it could be terrible, hopefully not. It's from the same writer as Cop Car, for reference. Enjoy. 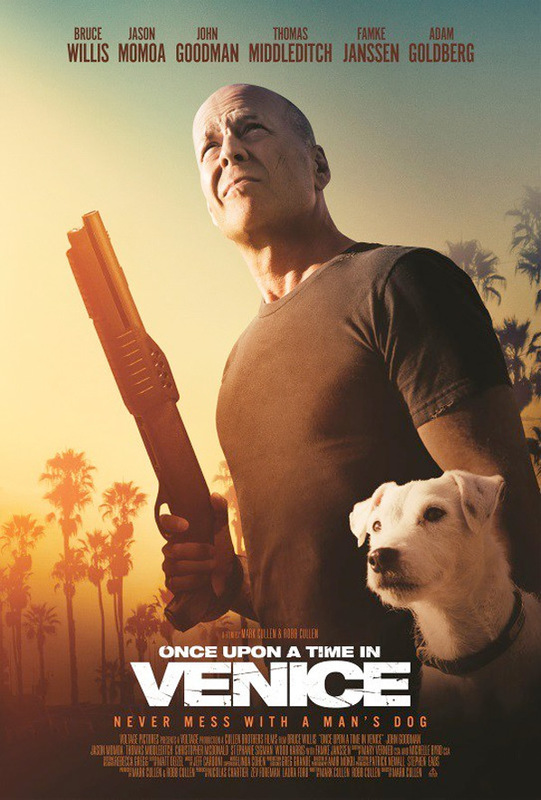 Steve Ford (Bruce Willis) is a down but not out L.A based Private Investigator whose professional and personal worlds collide after his loving pet Buddy is stolen by a notorious gang. A series of crazy circumstances find him doing the gang's bidding, while being chased by two vengeful Samoan brothers, a loan shark's goons, and a few other shady characters. They say a dog is a man's best friend, and Steve shows how far a man will go to be reunited with him. Once Upon a Time in Venice is directed by filmmaker brothers Mark Cullen & Robb Cullen, making their feature directorial debut with this film. They've previously worked as writers/producers on films like Cop Car, and TV shows including "Mr. Robinson", "Back in the Game", "Las Vegas", "Heist", and "Gary the Rat". RLJ Entertainment will release Once Upon a Time in Venice in select theaters starting June 16th this summer. What do you think of this? Interested?